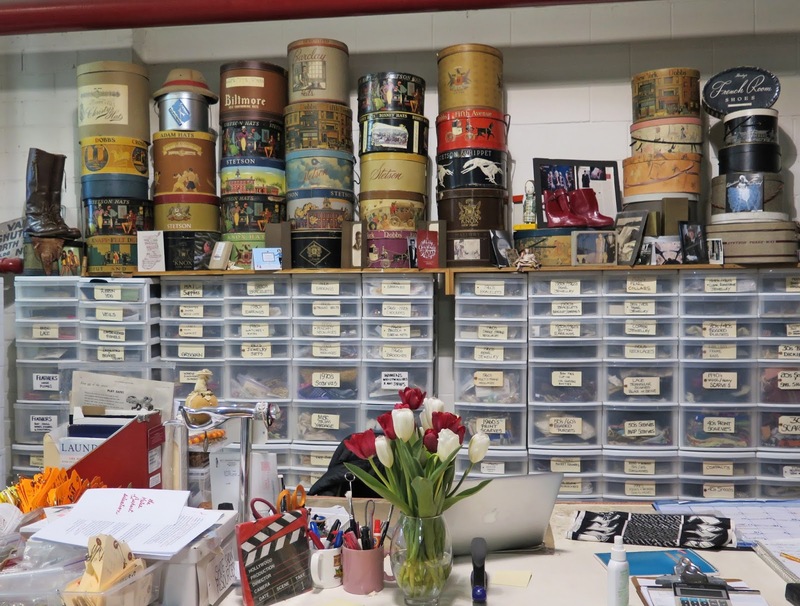 A couple of years ago I was at the Spring Toronto Vintage Show and met Ian Drummond, owner of the Ian Drummond Collection, a treasure trove of vintage clothing and accessories for rent to professional film, television and theatre productions. 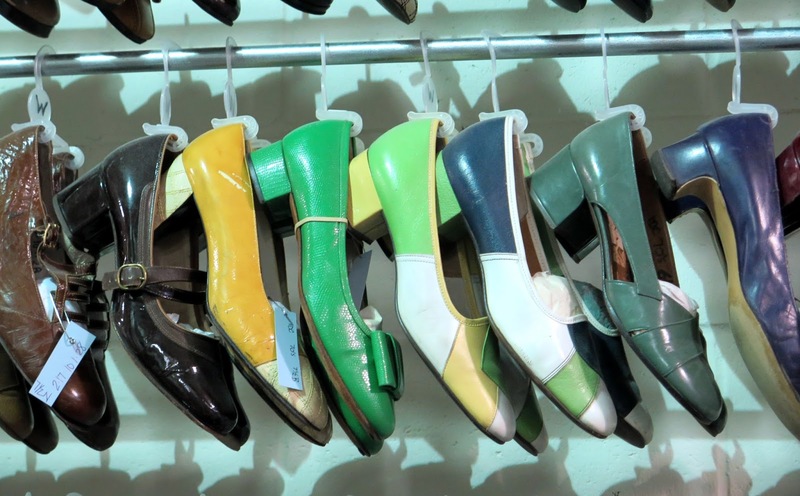 He also sells items at vintage shows and I had admired the large display of shoes in his booth (little did I know at the time that was just a fraction of his shoe collection). His assistant, Marla, found my blog and we struck up an occasional correspondence, and invited me to visit their collection, housed in a warehouse in Toronto. 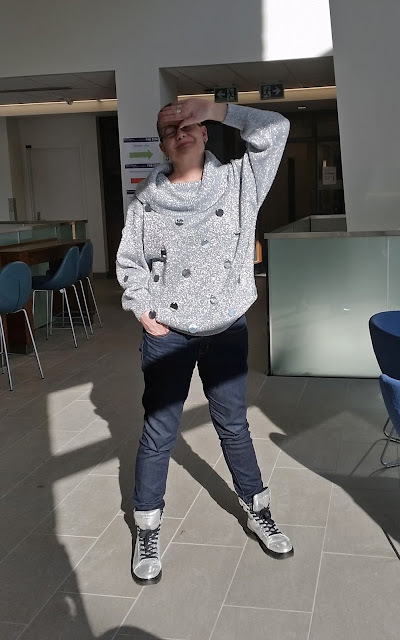 I was in need of an adventure, so this past Thursday I took them up on their offer, and made the journey from London to the wilds of Etobicoke (bus, subway, subway, bus). 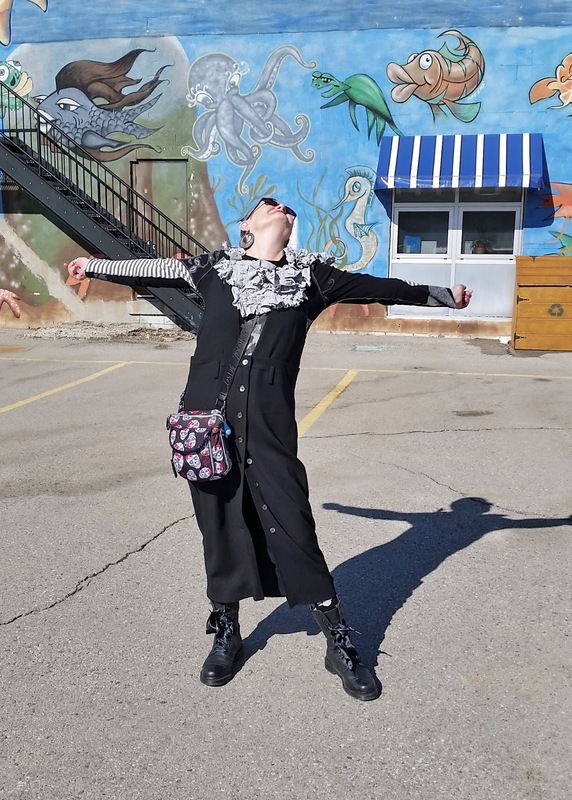 Drummond has been collecting vintage clothing for over 35 years and ran his own vintage store - 20th Century Frox - from 1984-1992. He started the Ian Drummond Collection in 1996. 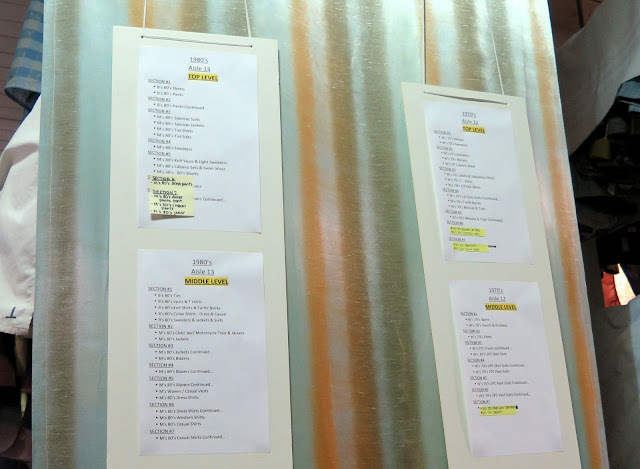 He has also worked in the Toronto film industry since the early 1990's and has been an assistant costume designer and extras coordinator for various projects. 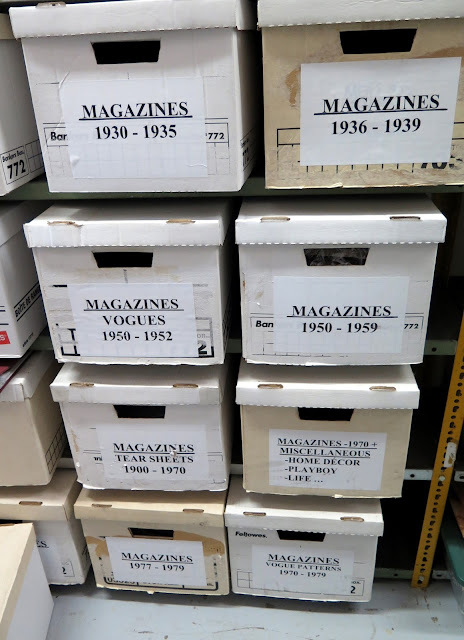 When asked how many pieces were in the collection, the answer - "We can't count". After doing some rough math, they estimate that there is approximately 45,000 pieces in the aisles. There are about 14 or 15 of these aisles of floor to ceiling racks ( I neglected to count). Each aisle is home to clothing from a particular decade. 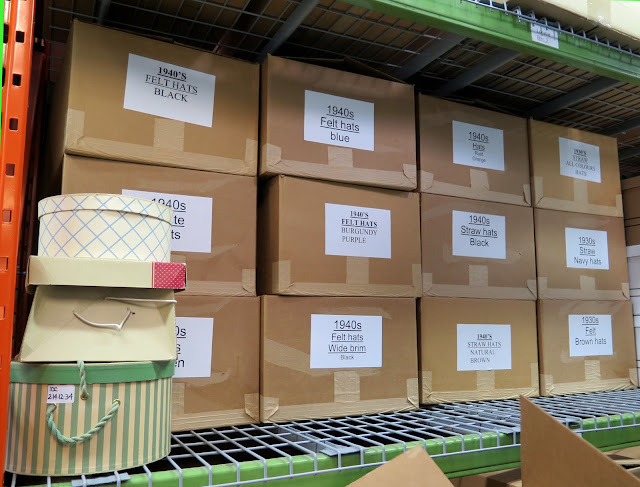 Within each decade, items are sorted by type of garment, size, and colour. 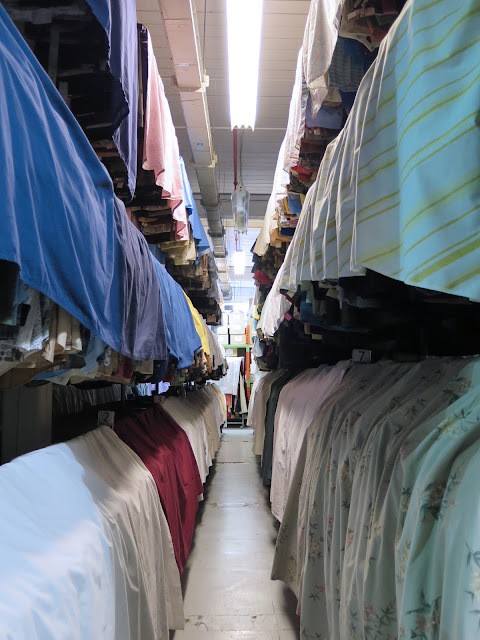 The clothing is covered by bed sheets to protect it from dust and light damage, and each day, a staff member walks the aisles, running their hands along the clothes to check for any sign of moths. The care and maintenance of the collection takes up the majority of the time of Drummond's staff. At the front of each aisle is a list of items in that aisle. Drummond has items from the 1890's to the 1990's. 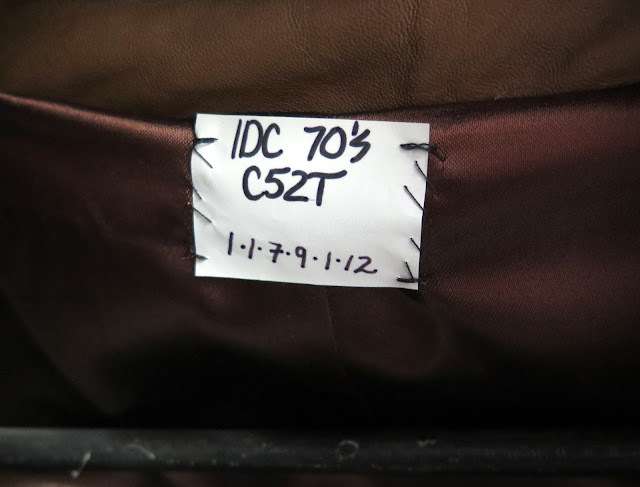 When new pieces are brought into the studio, they may need to be researched if the label or decade is not known. Each item is entered into a computerized inventory system and is given a tag with a series of numbers identifying it as men's or women's, the century, decade, etc. Everywhere you looked there was great eye candy. The sparkly 60's number on the left had been pulled to photograph for the upcoming Toronto Vintage Show. 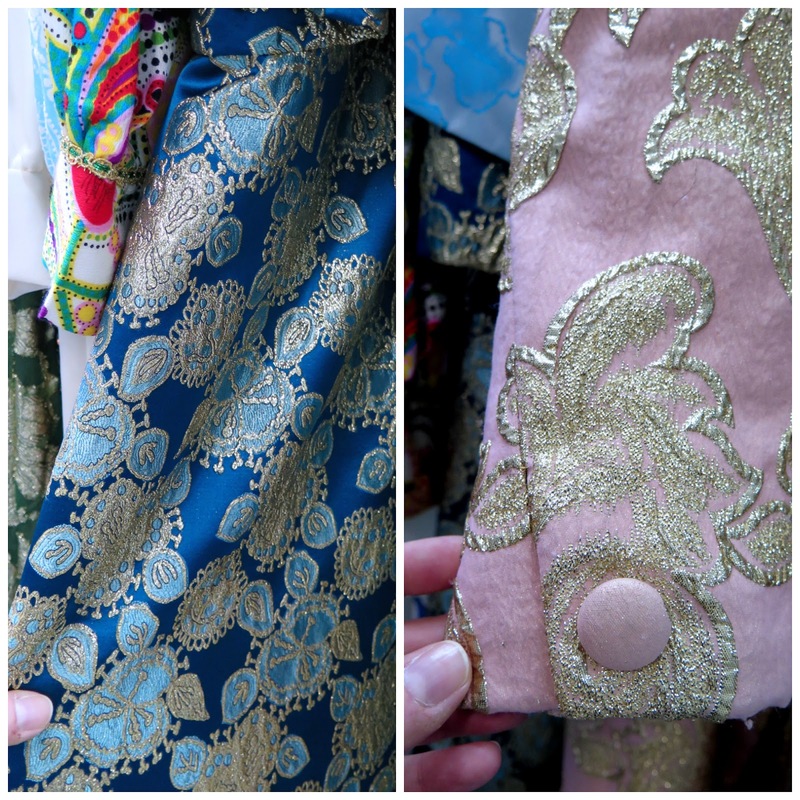 The gold and silver pattern on the 40's dress on the right is made up of tiny glass beads. Of course, not everything in the collection is a showpiece. 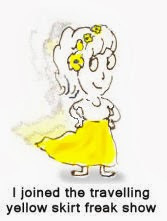 There are many pieces of everyday clothing from all decades which are needed for costuming extras for a film or series. Walking through the aisles I looked up and saw this section of vintage foundation garments. I also saw sections of 50's circle skirts, 1970's caftans and 90's goth wear. 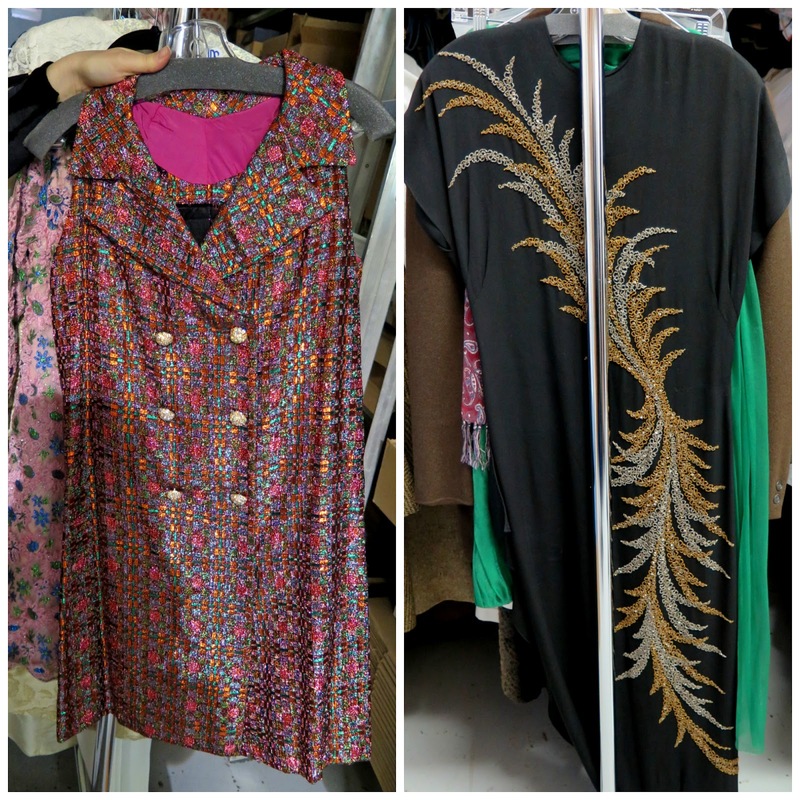 During a tour of the studio, we stopped at a rack holding a recently purchased collection of 1970's maxi dresses, many with matching coats. While the styles were not something I would wear, I love the colours and patterns, especially those with metallic embroidery. Drummond consults with one of his stuff who was organizing a collection of trimmings he had recently purchased. They are standing in front of the men's section of the shoe wall, which is home to approximately 2000 pairs of shoes. You can get a sense of the the ceiling height of the space from this photo. Of course, I wanted a photo of myself with the shoe wall. The shoes are dusted every week, and after after they are returned from sets, they must be cleaned and stuffed with new tissue before being returned to the wall. 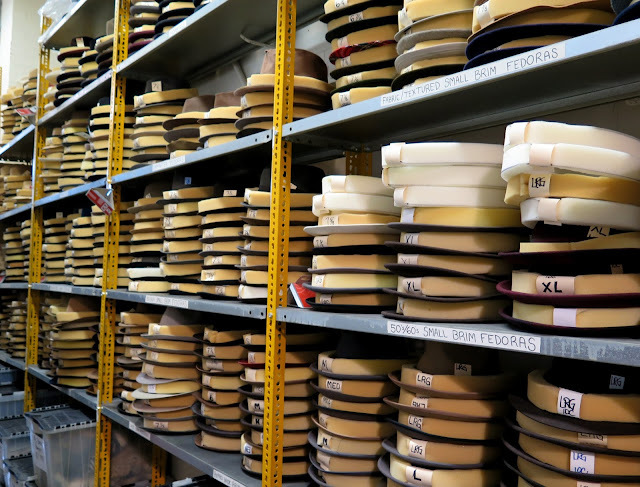 Men's hats are stacked on metal shelving running the length of one wall of the studio. Drummond has a spectacular collection of antique hat boxes which are stacked on the shelf in the photo above. Below the hat boxes are storage containers full of smaller accessories such as jewellery, collars, feathers, scarves and beaded bags. I could have easily spent the afternoon poring through the magazines in these boxes. 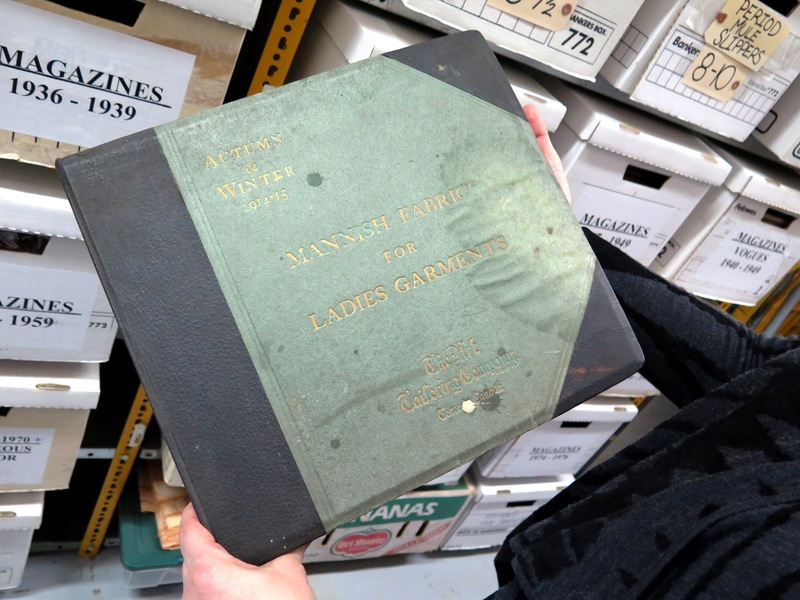 The studio has all kinds of fascinating items, including this "Mannish Fabrics for Ladies Garments", a book which most likely belonged to a tailor, that contains swatches of wool suiting that was available in 1914/15 for women's clothing. Prices for a suit made of each fabric were also included. Items from the Ian Drummond Collection can be seen in the film Fantastic Beasts and Where to Find Them, the series The Man in the High Castle, and the new Anne of Green Gables series. 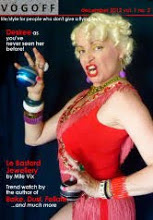 Ian Drummond will have a booth at the at the Toronto Vintage Clothing Show on March 4th and 5th at Exhibition Place.